Your desktop setup is incomplete without an assist from external storage. Xbox One X one users, as well, would be wise to invest in an external drive as a way of augmenting the console’s measly 1TB hard drive (the external drive needs to be USB 3.0-compatible and will be formatted when you insert the drive). The question is, which external drive is right for you? 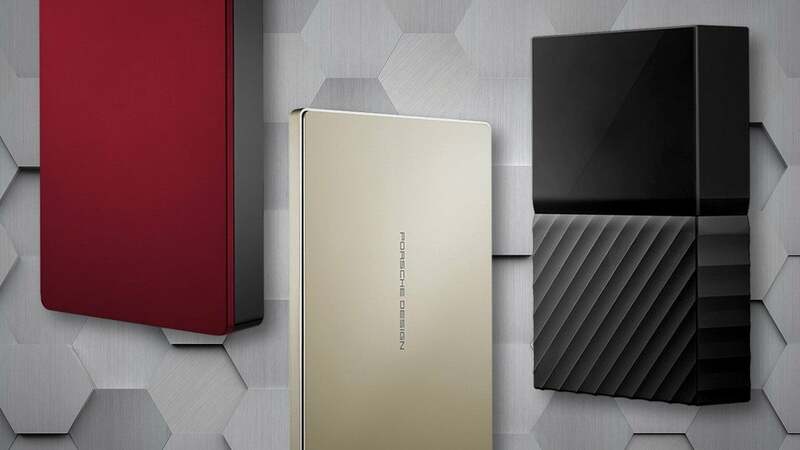 To answer that, we’ve combed through our reviews of both external hard disks and SSDs to pick the top drives we’ve tested. We’ll also walk you through what you need to know to buy the best external drive for your needs. Updated March 27, 2019 to add two reviews that put style on an equal footing with performance. The G-Technology G-Drive mobile USB-C external drive (available on Amazon) performs well, and G-Technology always delivers attractive designs that seem intended to harmonize with Apple products. Alas, along with the Apple design cues, comes an relatively Apple-like price. Read our full review. The Seagate Backup Plus Ultra Touch (available on Amazon) is a svelte drive that sports an attractive basket-weave polyester fabric, as well as good benchmark results. The price is pretty affordable, too. Read our full review. 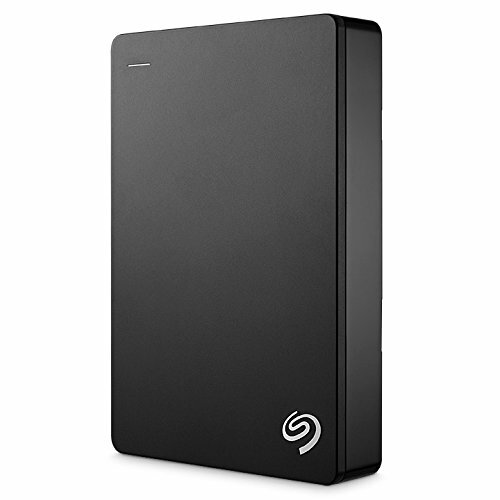 Our runner-up for this popular category is Seagate’s slightly larger and somewhat faster Backup Plus Portable. Like the WD above, it’s a USB 3.1 Gen 1 (5Gbps) drive. It tops out at 5TB in a single drive and can also be had in 1TB, 2TB, and 4TB capacities. There’s even a “fast” 4TB version that uses two hard drives in RAID for more performance. Remember that scene in Office Space where Peter Gibbons is desperately trying to save files to disk before getting out of the office? Yeah, mmkay. If you need ultra-fast performance in a package that you can put in your pocket, look no further than Samsung’s new T5 . Not much larger than a book of matches, the T5 comes in sizes from 500GB to 2TB. The best part is its speed. The drive features a USB 3.1 Gen 2 (10Gbps) over USB Type C.
The Extreme Portable SSD's convenient form factor trumps the drive's slight performance deficit compared to the Samsung T5. With its fast USB 3.1 Gen 2 (10Gbps) capability, this is currently our favorite portable SSD. The new drive here is the runner-up, which some may consider an even better pick than the Samsung T5: The Sandisk Extreme Portable. You can read our review of it here, where we give it 4.5 stars and an Editor’s Choice Award. It’s a seriously fast USB 3.1 Gen 2 (10Gbps) drive, just not quite as fast as the Samsung T5. You might still choose it instead of the Samsung T5 because it’s more comfortable with its rubberized grip finish. It comes with a nifty combo cable that adapts to old-school square USB Type A and also works with USB-C ports. The Sandisk Extreme Portable displaces the Sandisk Extreme 900 drive, but we think it’s a fair decision because the Extreme 900 is, well, pricey. At $700 for 1.92TB, it’s hard to justify over the Extreme Portable’s $521 for 2TB. Portable Thunderbolt 3 drives have been long overdue, but we’re happy to recommend Samsung’s new Portable SSD X5 drive. The full review is on our sister site Macworld, but let’s just say it’s stupidly fast and kinda like putting a scorching Samsung 970 Pro in an enclosure that fits in your pocket and not giving up much performance at all. Notice that we don’t say “best portable performance Thunderbolt 3 drive,” because by very definition, a Thunderbolt 3 drive should be blazingly fast. The only reason we’re not universally recommending the Portable SSD X5 is the relative rarity of Thunderbolt 3 ports on PCs. You’d need to be driving a brand-new Dell XPS 13 or HP Spectre x360 13 to be able to use Thunderbolt 3. SuperSpeed USB 10 Gbps is the official name for the USB 3.1 Gen 2 spec used in the fastest USB external hard drives today. 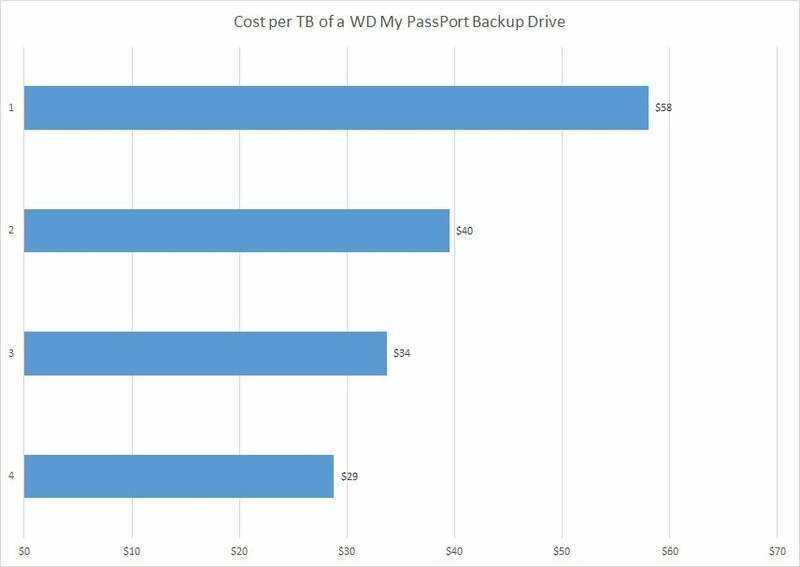 For example, we took the WD Black My Passport portable drive and compared the prices of the 1TB, 2TB, 3TB, and 4TB drive, on capacity and price. Keep in mind, this is one drive on one day (July 11, 2017), and just one vendor, Amazon, but it illustrates the point. In bar chart format, the false economy of the lower-capacity drive becomes obvious. So yes, if you’re buying an external drive, you pay more for the lowest capacity. However, this doesn’t mean you should automatically shell out for that 4TB drive. In the end, it still costs more. If you really don’t need the storage capacity of a 4TB drive, put that extra $57 toward something you actually do need. The vast majority of drives today are USB drives. From there it gets confusing. Today, the flavors include: USB 3.0, USB SuperSpeed, USB 3.1 Gen 1 (which is basically USB 3.0), and USB 3.1 Gen 2. For the most part, it doesn’t matter which of these versions you get (beware the much older USB 2.0, though). 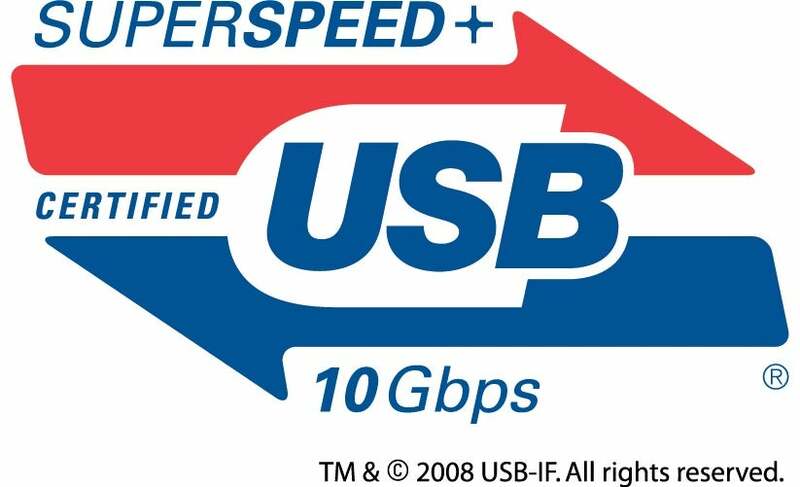 USB 3.0 allows transfer speeds up to 5Gbps, as does USB 3.1 Gen 1. USB 3.1 Gen 2 is the fastest USB version and can move data up to 10Gbps. No single hard drive today can surpass the throughput of USB 3.1 Gen 1, though. The sleight of hand to watch for is if a drive vendor lists “USB 3.1” in the specs without specifying Gen 1 or Gen 2. The only place Gen 2 can help is with an SSD. The good news is that while USB 3.1 Gen 2 used to be only in crazy expensive SSD external drives, it’s fairly affordable today. 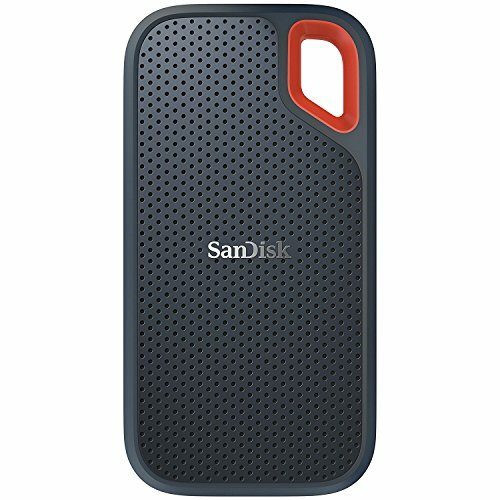 A Sandisk Extreme Portable SSD that is our runner up for portable storage can be had for $125 in a 500GB capacity. The top drive uses the older, slower Mini-USB interface. The second drive features today’s standard: SuperSpeed Micro B connector. The Orange drive features both a SuperSpeed Micro B and Thunderbolt 2. The bottom drive features USB-C or USB Type C at up to 10Gbps. External drives come with a variety of confusing and esoteric ports. Here’s what you need to care about. 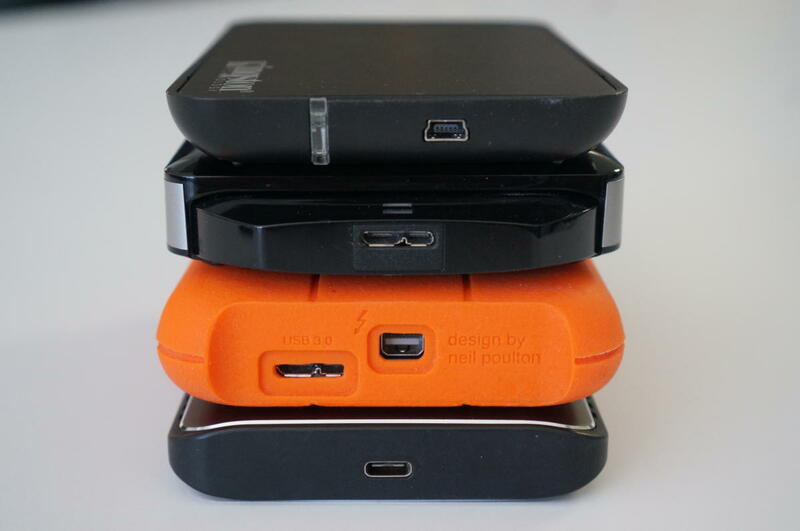 USB 3.0 Micro B port is the most common port on portable backup drives today. It’s basically the same Micro USB port used on your phone, but beefed up with more connectors to hit USB 3.0 speeds. It’ll hit 5Gbps and for everything but the fastest portable SSDs is still fine. USB 3.0 Type B port is the larger, blocky version of USB 3.0 Micro B. USB 3.0 Type B is often used in larger external drive enclosures. As its name implies, it’ll hit USB 3.0 speeds at up to 5Gbps. USB Type C is the newest of the USB connectors and features a nifty reversible design that’s being used on phones, tablets, and PCs. Its most important feature is that it supports up to 10Gbps transfer speeds. The key phrase here is “up to.” USB Type C is just the connector and port on the drive (or phone), but the rules allow USB Type C to support transfer speeds from USB 2.0’s 480Mbps to USB 3.0’s 5Gbps and USB 3.1’s 10Gbps. So don’t caught up thinking that because a drive you buy has this nifty new interface and port, you’ll get awesome speeds. And no, hooking up a hard drive to a USB Type C port doesn’t make anything faster. Outside the theoretical speed advantage of USB Type C is a power advantage. A standard USB Type C port on your desktop or laptop should be able to support a minimum of 15 watts, so you should be able to run larger, more power-hungry drives. Thunderbolt 3 was designed as one cable to rule them all, and it’s rapidly looking like it will. The port basically adopts a USB Type C port and connector but also offers the ability to run pure PCIe at up to 40Gbps. For the performance-minded, Thunderbolt 3 is the natural alternative. One negative, though: It ain’t cheap. Our recommended portable, the Samsung Portable SSD X5 is $697 for 1TB of capacity. 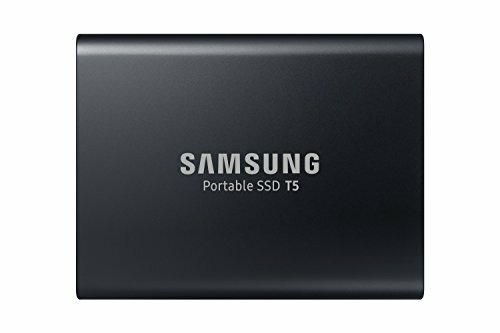 A 1TB Samsung T5 on USB is only $278. There’s no reason to pay extra for a Thunderbolt 3 drive unless it’s high-performance. A Thunderbolt 3 portable hard drive would be a complete waste of time and money for most people. Thunderbolt 2 is, at this point, a dying port. Using a miniDisplayPort connector, it only really gained popularity on Macintosh PCs and is now being put out to pasture. Unless you have an older Mac, there’s really no need to invest in a pricier Thunderbolt 2 drive or port today unless it’s for legacy support issues. eSATA is another mostly dead port. Made as an extension of SATA, eSATA was a cheap way to get beyond the 60MBps performance of USB 2.0. USB 3.0 put the last nail in its coffin, though, so you can ignore this port today. Like Thunderbolt 2, the only reason to invest in an eSATA drive is for use with older computers. There’s an old saying that “one is none and two is one.” You can apply that phrase to space capsule oxygen tanks, plane engines, or whatever mission critical system you depend on, including hard drives. The philosophy on external drives used for backup is that copying 10 years’ worth of photos onto an external drive and then erasing it on your PC’s local drive isn’t actually a backup at all. If that drive gets chewed up by the dog or otherwise dies, you’ve lost it all. If you’re paranoid about backups, consider getting two backup drives, possibly in different colors, and then alternating complete backups of your PC to the drives every few month. This should mitigate data loss should a drive die. Truly paranoid people will even take the second drive to work so there’s no chance of losing both drives to the same local disaster. 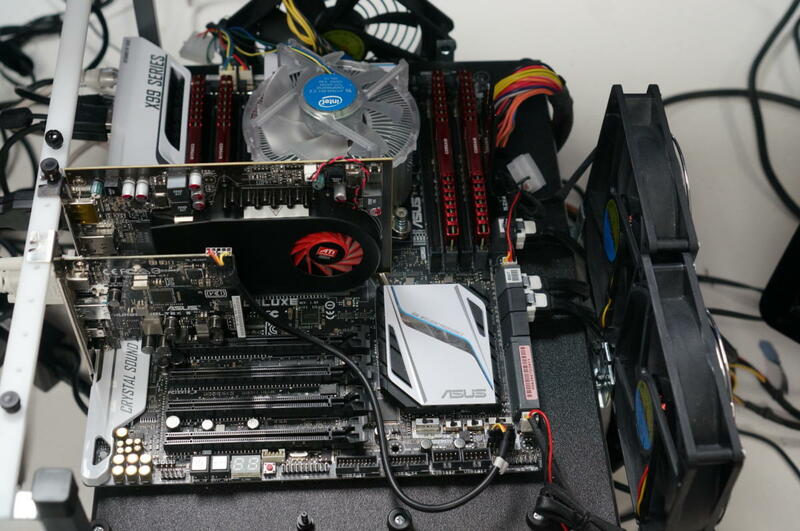 Our storage test bed is a Core i7-5820K with 32GB of RAM on an Asus X99 Deluxe board with an Asus Thunderbolt EX 3 card or AFT USB 3.1 add-in card. We use our standard storage test bed to evaluate the performance of the drives we review. It’s an Intel six-core Core i7-5820K on an Asus X99 Deluxe motherboard with a Thunderbolt 3 card and 32GB of RAM running Windows 8.1. We use various synthetic benchmarks including Crystal Disk Mark 5, AS SSD, and Iometer. We also use a manual file-copy test where 20GB of small files and another 20GB single file are written to and read from the storage drive. The test bed boots to a plain SATA drive, but all targets and sources for drive performance use a 24GB RAM disk. We also use an Asus Thunder EX3 discrete Thunderbolt 3 card and Asus USB 3.1 10Gbps card for testing. The Asus card uses an Asmedia 1142 controller. 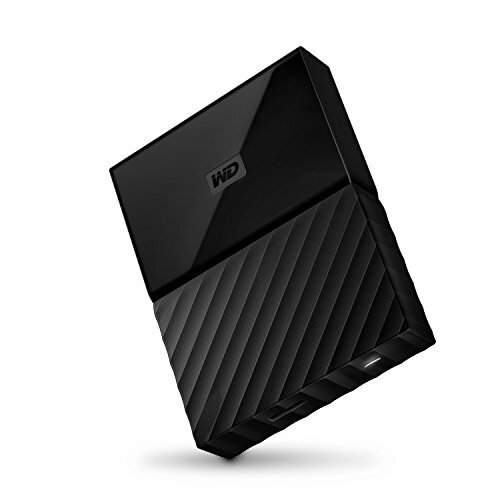 If you’d like to learn more about our top picks as well as other options, you can find links below to all the external drives we’ve reviewed. We’ll keep evaluating new ones on a regular basis, so be sure to check back to see what other drives we’ve put through their paces. Quite frankly, the best portable storage product on the planet. Far faster than the average USB 3.x thumb drive, not that expensive (for an SSD), and available in capacities up 2TB—it's the one you want. At least until the USB SuperSpeed+, Gen 2 version shows up in a year or two. A drive that can hit 10Gbps USB 3.1 speeds!